I am not a technology-person. Well, at least not when it comes to books. Ebooks and ereaders are all okay; but for me, books need to have a physical presence. It reminds me of dialogue I loved from 'Buffy the Vampire Slayer', where Giles says, "Smell is the most powerful trigger to the memory there is. A certain flower or a whiff of smoke can bring up experiences long forgotten. Books smell... musty and rich. The knowledge gained from a computer is... it has no texture, no context. It's there and then it's gone. If it's to last, then the getting of knowledge should be tangible. It should be, um... smelly." I love the smell of paper and ink; old as well as new. I love to hold the book in my hand, curl up on a couch and get absorbed in that world. I love the sense of satisfaction I get, as I turn the last page. I do read a lot on the computer now, but it hurts my eyes after awhile. I don't like to scribble in the margins or dog-ear my books, but I like the option of getting to do it. Reading a real book is so much more personal, than looking at a screen. I don't like audio books either - I like to listen to myself read the book, inside my head - not someone else. As the world "develops", more and more things are getting replaced by screens. I don't like that - I don't want the world of real, paper books to be replaced by all things digital. As much as all of this is true, it's also true that real, paper books are not that durable. It's also much easier to carry books around in your phone, than to actually carry a dozen books. If I had to carry as many books on vacation as something digital can carry, I would probably end up with a hunchback. I would like to have a book that could stand the test of time; but still be an actual, physical book. Something that isn't made of a material as bio-degradable as paper, yet is eco-friendly - something that would last centuries without damage - something that actually allows me to turn the pages with my hands - something that smells and has texture - something that won't turn soggy if dropped in water nor will there be any kind of electric current thing - something that is light in weight - something that is all this but affordable. A super-book of some sort. Something that is new, but it's still the same old book, you know? Yes, that's it. I don't have many demands from technology; hell, I don't even understand most of the stuff that is there - but this, the super-book, that's something I'd love to own! I was sitting in my balcony today, when I noticed a sparrow perched on a wall of the house opposite to mine. I took out my sketchpad and made a quick sketch of him. Just as I was finishing he flew away. I looked around to see if there were any other sparrows nearby; there weren't. 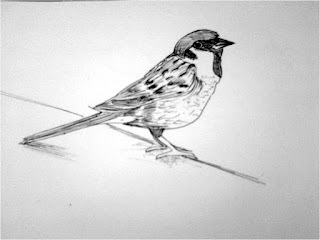 Then I realized that was the first sparrow I had seen in months, years, even. Where have all the sparrows gone? The bird that you would see everywhere when I was a child, the bird who had led its way into so many of my nursery rhymes - has vanished now. I remembered the story of how ornithologist Dr. Salim Ali developed an interest in birds when he came across a rare Yellow Throated Sparrow. It's funny how the Common Sparrow is just as rare, now. And who is to blame, but us? I sat there thinking of the many things that have changed around me in the short span of my life. There are few big trees around, and the houses are larger. There are less number of people on the street, only cars and bikes. There are less number of birds around my house, less chirping, very few of the butterflies that I loved to look at come here now. And we can owe it all to pollution. Development happens when there is less green and more steel; when children stay glued to computers and mobile phones even in their early teens; when the noise of the traffic is more than the happy chirping of the birds in spring; when the air is filled with so much smoke that you keep your windows shut at all times; when the hills are slowly dug out to build cities and skyscrapers. I wonder what has happened to the world, in such a small time? I would like to believe that the sparrows have flown off to a better place. No more things should be presumed to exist than are absolutely necessary. I haven't been reading much lately; at least not anything really good. 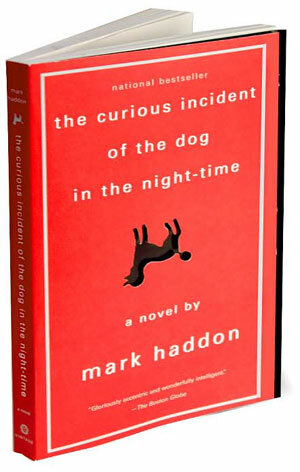 But that was until yesterday, when I read a book called : The Curious Incident of the Dog in the Night-time by Mark Haddon. You may have already heard of this book - it was a huge success when it was released and was on many bestseller lists for quite a long time. I hadn't - but now that I have read it, I would strongly recommend it. The book is actually supposed to be a detective storybook that the main character, a fifteen year old boy named Christopher, writes. The boy suffers from something like the Asperger's syndrome; while he can interact with the world when necessary and can communicate, he has some autistic traits like intense dislike of being touched. Christopher often gets side tracked from writing the mystery which makes the book a bit like a personal journal than a novel. Since the book is written from Christopher's point of view, it provides a completely different perspective on the world. Christopher cannot understand other people's emotions - he never mentions how things make him feel(other than physically). That gives the book a lot of emotional blanks that the reader has to fill in himself, which creates a more personal attachment to the book. Usually in a narrative style book, the reader tends to identify himself with the narrator. In this book, I found myself identifying more with the other characters in the story. Watching both Christopher and everyone in his life trying to bridge the emotional gap between them makes the book very real and very heartbreaking. Christopher's fascination and understanding of mathematics and logic, his staunch dislike for metaphors (like he says, even the word metaphor - which literally means carrying something from one place to another- is a metaphor) are some of the things that added the necessary humour to the book. I grew very fond of Christopher's frequent use of drawings; and not to mention, his love for prime numbers. "I think prime numbers are like life. They are very logical but you could never work out the rules, even if you spent all your time thinking about them"
Remember the scene in 'Tarzan', when Tarzan takes Jane's hand and compares it to his - when he realizes they are the same kind? Remember when he is trying to learn to speak and he says, "Me, Tarzan...You, Jane"? 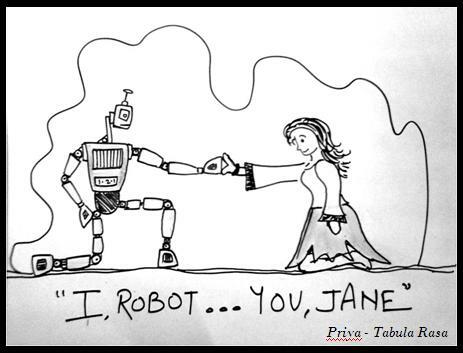 Remember 'I, Robot' by Isaac Asimov? Since this is my first attempt at an illustration, it took me some time. I even had a little issue with the way the robot is sitting - but then I decided: hey it's a robot, he can turn just his head around without having to turn his body, can't he? But, while this is not the best I can do, I had a lot of fun doing it!! !